Newtown Teacher And Students Remembered For The Light They Brought : The Two-Way Family and Friends celebrate the lives of Victoria, Daniel, Caroline and Charlotte, recalling how each of them could light up a room. The teacher and three students were killed in the school shooting in Newtown on Friday. 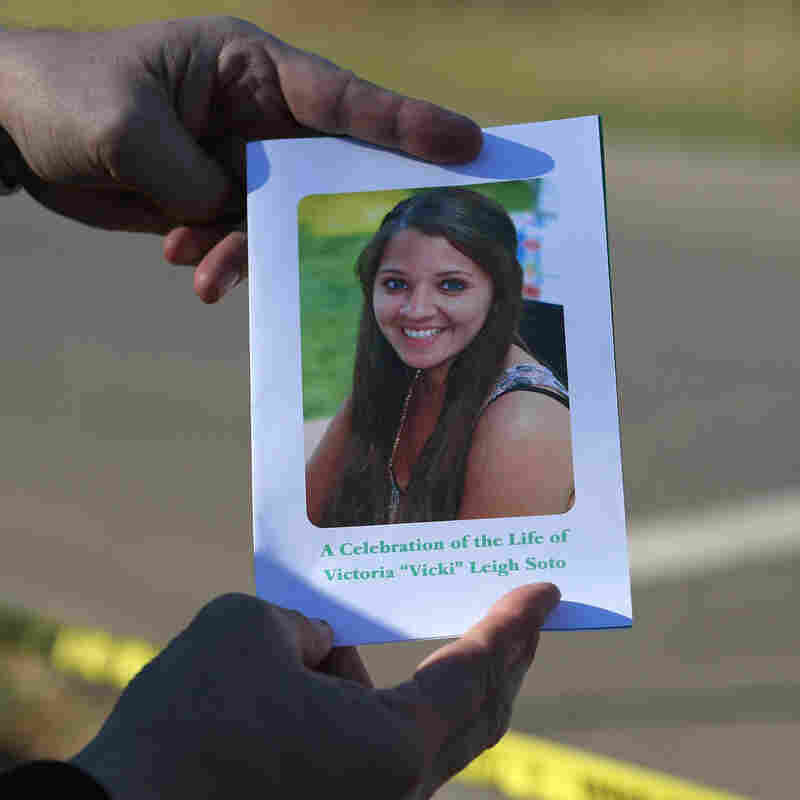 Mourners attended funerals for three children and a first-grade teacher in Newtown, Conn., Wednesday, the third day of services for the victims of a mass shooting that has reignited debate over gun control in the U.S.
Victoria Leigh Soto, 27, is the first Sandy Hook Elementary School teacher to be laid to rest. The Associated Press reports that Soto, a first-grade teacher, "has been hailed as a hero for dying while trying to shield her students, some of whom managed to escape." A mourner displays a program for the funeral of slain teacher Victoria Soto, 27, in Stratford, Conn. In an interview with CBS News, Soto's family says she died trying to protect her students. As some of them tried to run away from the gunman, their teacher reportedly tried to distract him. Paul Simon made a special appearance at Soto's funeral, singing "The Sound of Silence." Speaking at her funeral, family friend Ryan Ortiz described how people will remember her final moments. "In my opinion, she was that light amidst the darkness that was going on that day in that school," Ortiz said, according to NBC News. At the same time as Soto's funeral in her hometown of Stratford, Conn., the family and friends of Daniel Barden gathered in Newtown to remember the first grader. In a photo published by The Wall Street Journal and other news outlets, Daniel can be seen wearing a gingham shirt with a floppy mess of red hair and missing his two front teeth. Despite Daniel's young looks, his family described the seven-year-old as an "old soul." His father, Mark Barden, tells ABC News that his son would "hold doors open for adults all the time," adding, "Our son had so much love to give to this world. He was supposed to have a whole lifetime of bringing that light to the world." Barden's funeral was held at St. Rose of Lima, the same church where mourners also gathered later to remember Caroline Previdi. Known to some friends as "Silly Caroline," her family wrote in their obituary of the girl that "her smile brought happiness to everyone she touched." Each of the victims buried Wednesday were remembered for their ability to light up a room, including first grader Charlotte Bacon. Newsday says Bacon's older brother, Guy, attended Sandy Hook as well; he survived the shootings. Charlotte, 6, was wearing a pink dress and boots when she died Friday, an outfit that the AP reports was meant to be a gift for the holidays. But after Charlotte pleaded with her mother, she finally gave in, allowing her daughter to wear her new dress and boots to school. Charlotte was buried at the Newtown Village Cemetery. She was one of 20 children and six adults killed at Sandy Hook in Friday's attack.